Maintaining an installation means all operations that keep it in good condition or return it to its normal operating state in the event of a failure. 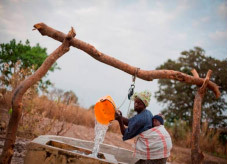 The aim with a water well is to keep the structure and well pumping and drawing equipment in good condition and preserve the good quality of the extracted water. Well builders who must identify and make known the needs and recommendations in terms of maintaining and servicing a well. But also well users, who must have undergone awareness-raising and who must have the worry, with their management committee, of taking charge of the well operation and maintenance as far as they are able. Such malfunctions sadly lead to the abandoning of a very large number of wells that have been dug or bored every year worldwide. All types of well are concerned, especially those dug in isolated rural areas when the wells were built without assistance from the inhabitants. The areas surrounding the well must be cleaned regularly. The capture must also be cleaned by removing the debris which can fall into the well. It is important to prevent wastewater and human or animal waste being deposited anywhere near the well, as it could penetrate the soil and potentially pollute the water table. If the well is used for drinking water and to water livestock, the watering place for the livestock must be well away from the well. A cover must be placed on the well casing if the diameter of the well is large. Analysing water quality is unfortunately not a regular occurrence and is even quite rare once a well goes into service. If there no recent analyses or results of previous analyses available, it is very prudent if not necessary to have the water analysed again quickly. An annual bacteriological analysis is highly recommended. Where there are serious risks of contamination, analyses to screen for chemical health hazards like nitrates, pesticides, heavy metals and volatile organic compounds (hydrocarbons, solvents, etc.). It is also sensible to carry out analyses when the water has a different taste, colour or smell. The same applies when there are unexplained illnesses in the family or the neighbourhood or if chemicals or fuel oil are seen to have been spilled near the well. It is also advisable to conduct analyses to check that the water is drinkable after disinfecting the area. The same applies if the area surrounding the well or the well itself has been flooded and may therefore have been contaminated. Pumps, pipes and all other equipment (for example, winch, pulleys, etc.) must be checked regularly. Any breakdown must be repaired. It is important to monitor the well structure and wall coating. A damaged well casing or well liner when the casing has broken or following an ingress of dirty surface water into the well can contaminate the water through infiltration of contaminated water from the surface. Wells can also be contaminated if bored in cracked or permeable soil with a sufficient layer of protective soil, especially if the well casing or liner is not long enough. Proper maintenance requires good knowledge of the history of the well construction and operation. The maintenance tasks demand different skill levels depending on the difficulty of the intervention. Some tasks can be undertaken by the well users, like keeping the surrounding area and the well itself clean. Other tasks like servicing equipment and certain simple quality analyses require prior training and special tools or instruments. Work on the well structure (well casing masonry, for example) requires the intervention of specialist craftsmen or contractors, preferably local. The cost of maintaining a well can vary according to the type of well and its environment. It is therefore difficult to give an accurate estimation. Certain studies have nevertheless been used to produce a realistic order of magnitude in relation to the cost of constructing a well. Annual maintenance of a well is estimated to be between 2.5% and 5% of the total construction cost. Raising the awareness and educating users to the need for maintenance and the installation’s maintenance and servicing tasks are essential for sustainable operation of a well. It is a good idea for users to create a well management committee to take responsibility for maintaining and servicing the well. 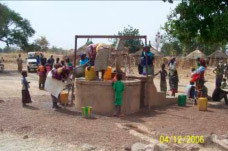 It is also sensible to charge inhabitants a fee for using the well to finance the well maintenance and operating costs.